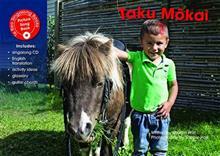 Taku Mokai is about children looking after their pets. There are five children featured, each with their own pet. They introduce their pet, give its name and explain how they look after their pet, all in simple repetitive te reo Maori sentence structures. The last child is a boy ... read full description below. A song about pets and how to care for them. Includes guitar chords.